Are We Running out of Land due to the Greenbelt? For years we've been fed a myth by the Builders' Association that we are running out of land. We were also told that the Greenbelt is to blame for the imaginary shortage of land and for skyrocketing home prices. But is that really the case? 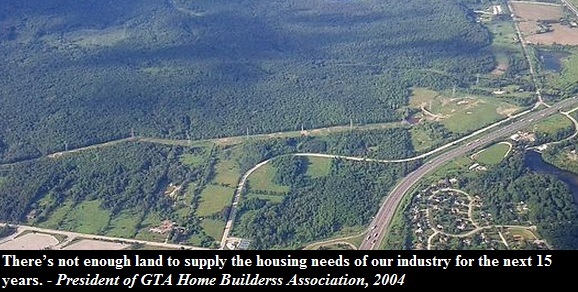 The idea of establishing the Greenbelt in Ontario was announced by McGuinty back in 2003. So if the Greenbelt was really behind the increased scarcity of land and higher real estate prices then it should be reflected in the property appreciation rates. Cities that lie inside the Greenbelt should have significantly higher price growth compared to cities that lie outside the protection area. But this is just not the case. Furthermore, over the years there were many reports that came to the same conclusion. Back in 2004 there was a report from the Environmental Defense which stated that there was not factual evidence that the Greenbelt will lead to higher housing prices. The report pointed to the fact that between 1972-75 land and housing prices grew at a rate of 40% more than the rate of inflation. Federal government was shocked by such a dramatic phenomenon that they established a task force to find out why prices rose as they did. Chart HT to Ben Rabidoux from North Cove advisors. While government officials did not entirely dismiss land use regulation as a source of real estate price increases, they attributed the causes of this phenomenon to the same source as it appears to be today. of it more as 'investment'"
sharply upwards. 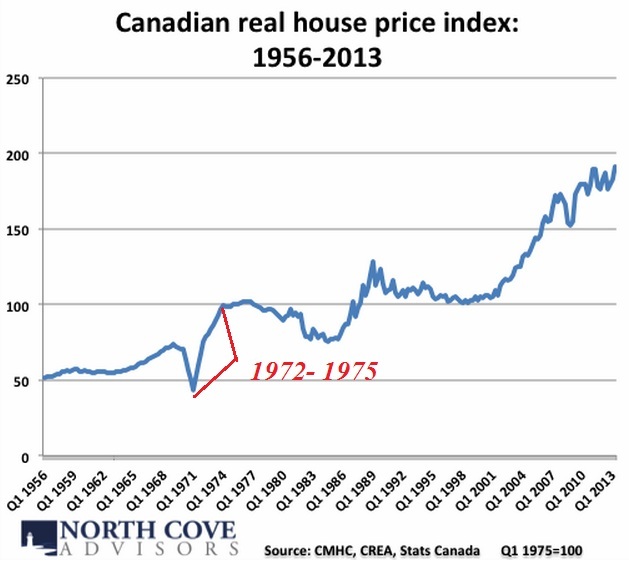 All of our evidence points overwhelmingly to demand factors and changing expectations as the primary forces behind the 1972-75 land and housing price boom"
Is it possible that home prices today are going up for the same reason that they did back in the early '70s? I think so, as after all there's plenty of land - even RBC would agree.